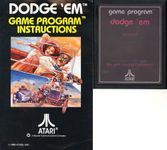 Dodge 'Em is a 1980 Atari 2600 video game, a driving game based on a single screen of four concentric roadways. The player controls one car and has to drive counter-clockwise, avoiding computer-controlled cars whose sole aim is to produce a head-on collision. Source: Wikipedia, Dodge 'Em , available under the CC-BY-SA License.